The Samsung Galaxy Tab is a wonderful device for enjoying and sharing your multimedia content. The tablet supports HD video content in a wide range of multimedia formats encoded in DivX, Xvid, MPEG4, H.263, H.264 and more. To be honest, videos of .avi, .mp4, .mkv, .3gp and .flv can be played back smoothly on Galaxy Tab most of the time. Pavtube Mac Video to Galaxy Tab Converter is recommended as a best tool for Mac users to complete the Video to Galaxy Tab conversion. This software converts a given video file to the format that will play correctly on your Galaxy Tab and other portable devices and guarantees perfect synchronization.It can run on Yosemite system without any problem to meet Mac users’ needs. 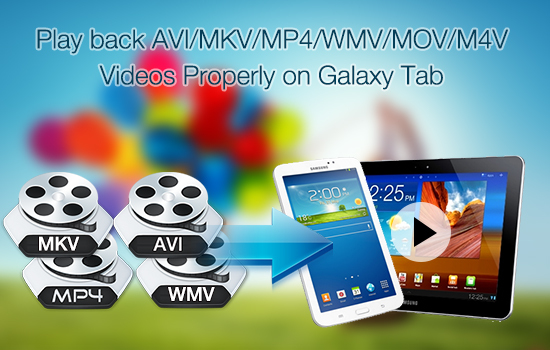 How to Playback AVI/MKV/MP4/WMV/MOV/M4V Videos to Galaxy Tab? 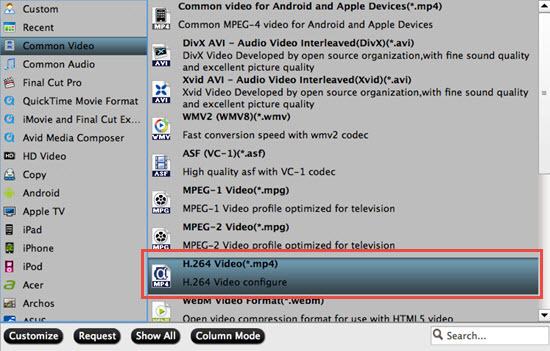 To convert Video to Galaxy Tab, you can click "File">"Add Video/Audio" or "Add form folder"to load video source. Or click those two icons on the top of the main UI can also be used to add raw videos. 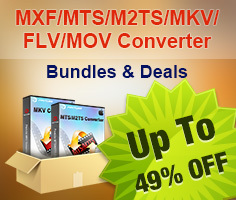 The Pavtube Video converter supports multiple video formats and codec, such as H.264, MPEG-4, MPEG-2, Xvid, TS, AVI, MP4, WMV, MKV, MOV, TOD, M2TS, MTS, MOD, VOB, TiVo and more. Although Galaxy Tab supports videos up to 1080p, the 1920*1080 HD formats are not ideal solution for watching videos from Galaxy Tab. Comparing with SD video formats, the HD formats generate much bigger files. A 90min movie could takes up 6-18GB if it is encoded with 1080p HD formats. And you can hardly tell the differences between SD and HD quality when playing on Galaxy Tab. There are visibly differences on a 48'HDTV, but not on a 7'Galaxy Tab. So you may click on the pull down menu of "Format", and then follow "Common Video" >"H.264 Video (*.mp4)"
1.With the update of Samsung Tab, if you have the latest Tab from Samsung , then you can totally go for "HD Video">"H.264 HD Video (*.mp4)" which will be outputted as H.264 high profile. 2.As we all know that Samsung has output their latest 4K camera- Samsung NX 1. How to enjoy the Samsung NX 1 videos decoded under H.265 on your Samsung Tab? Check here to learn more. According to my test, the AVI, MP4, and MKV format work well with Galaxy Tab. 3GP format is not recommended, for this format gives vague image for Galaxy Tab playback. WMV videos plays fine on Galaxy Tab, but it’s not a friendly format for Mac OS. The best format for Galaxy Tab is H.264 encoded MP4 or MKV format. The two clips I tested not only play great on Galaxy Tab, but also take up less disk space. If you also have an iPad, "iPad">"iPad Video H.264 (*.mp4) "is your top choice, because this format is good for both iPad and Galaxy Tab. Click "Convert" button to start converting videos to Samsung Galaxy Tab on Mac. 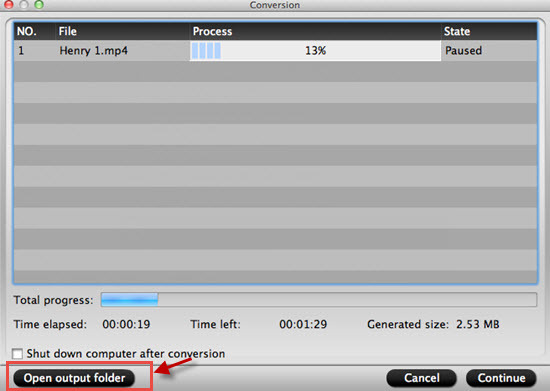 After conversion completes you can click the "Open output folder" button to find the converted files. Now the videos are optimized to be friendly for Samsung Galaxy Tab. -To get higher video quality, simply click "Settings", find "Bitrate" in Video column, and set it to "high quality" before the video to Galaxy Tab conversion starts. -To watch HD contents on HDTV from Galaxy Tab, you may choose 1080p video. Just follow "HD Video" and choose DivX HD AVI or MPEG-4 HD MP4 video format. Note 1080p MKV is not acceptable for Galaxy Tab. -To convert videos, and rip DVD and Blu-ray Disc movie for Galaxy Tab, you may use the all-in-one package of Pavtube BDmagic for Mac.